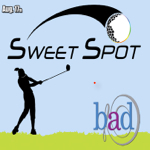 Sweet Spot is coming your way. Thousands of women from all over the world will be descending on Denver for the largest International Golf Event for women. It’s a first for Denver so you don’t want to miss Sweet Spot.